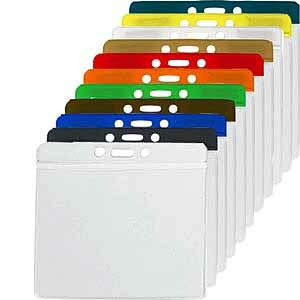 Color coded badge holders in your choice of nine shades of durable, protective vinyl. Accent the clear vinyl front panel using color as a solid back, a solid bar along the top, or picture frame with a clear back panel. 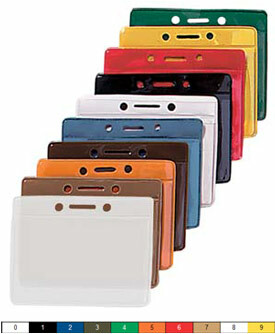 Colored badge holders are available in one vertical and three horizontal designs. Our colored badge holders satisfy most applications and come with pre-punched holes so they can be worn with strap clips, neck chains, neck lanyards, wrist coils or over a button. 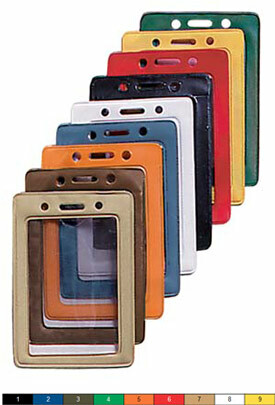 Maximum ID size for our colored badge holders is Data/Credit Card size (2-21/64 x 3-3/8").